To every story is a beginning. A genesis. A point where a guy looks at a hat and thinks “Yeah, I could see myself collecting 400 more of these” and then embarks to do so. I don’t consider my story spectacular in any way. I already had a penchant for headwear; a result of generally unruly hair that stood straight up throughout my adolescence. My cap collection consisted of terrible trucker caps and well-worn flexfits until a good friend of mine and fellow cap collector named Brian showed me his formidable cap collection one day. I tried on one of his caps and by some strange luck, we discovered we both have the same head size (7 5/8). The beginning. A short time later I picked up what would be the first of many: an all-black and an all-white Padres cap. Over the years I picked up caps as I was able to and in the oddest locales at times. Finding steady work exacerbated my collecting and boxes of caps began to show up at my doorstep every other week. Finding myself working for a hat retailer only made things worse. My employee discount was promptly depleted. My collection now sits at 437 caps as of this writing. First and foremost, I was always a fan of the Padres. I was raised a fan through my father. I remember having the ’98 World Series playing on every TV in the house. I also remember my dad asking Tony for a birthday present in the form of his 3000th hit (he of course, collected that hit the next day). Collecting these caps has helped me cement a love for baseball that I wouldn’t have had otherwise (I was raised playing football). I was very fastidious about styling my hair throughout high school. The hat was an escape from that particular morning routine; pick a cap, slap it on and go. Finding a job where not only wearing a cap is allowed but highly encouraged is a bonus and a half for me. Being as tall as I am (6’7), it’s difficult to find certain things in my size (don’t get me started on shoes). The fact that I can always find a cap in my size only adds to the appeal. The collection has now grown so massive that it takes up a room in my house. I have dubbed it the Dojo. How about some stats of where I’ve ended up now in my collecting? I started collecting purely Padres caps, and my collecting hasn’t swayed too much from this motif. My diversification in collecting came around later after I joined Team Fitted and was exposed to a world of caps I never knew existed. Even still, I can never resist a Padres cap. My Padres cap collecting has turned more toward vintage and hard-to-find fare as of late. The affiliates I refer to are the minor league teams of Padres past and present. I’m shooting to have at least one cap of each current Padres minor league team and am digging into the past for older caps. Part of the fun in collecting is the search. The sorta-hometown team for me just across the border, the Aguilas de Mexicali (Mexicali Eagles) caps are considered hard to find around here only because of the team’s popularity. Their games are loud and energetic and provide for a fun, different brand of baseball. It’s easy to be a fan of the team and their great looking logo. The oddest thing about my collection is that I own 5 Blue Jays caps. Why? I’m not sure, really. The first Blue Jay cap I picked up was in Colorado and was their retro on-field cap. Since then I’ve snagged a few more Blue Jays caps, including some very rare caps you’ll read about later. Part of being a cap collector is creating your own custom cap and collecting caps that other collectors have commissioned to be made. It’s hard to pass by a great looking cap made by another collector. You’ll read more about the kinship between collectors and their custom caps later. I have a lot more caps you’ll get to see later! Thanks for checking out my collector’s story. Stay tuned for more cap-related goodness in the near future. Mate that collection is dope, I’m not massively into caps myself but I respect ya hustle ! I’m also in the same boat with the shoe situation as well though 😦 Looking forward to reading more about your collection ! Quite the collection. I’m starting to lose a room in my house to my caps as well. 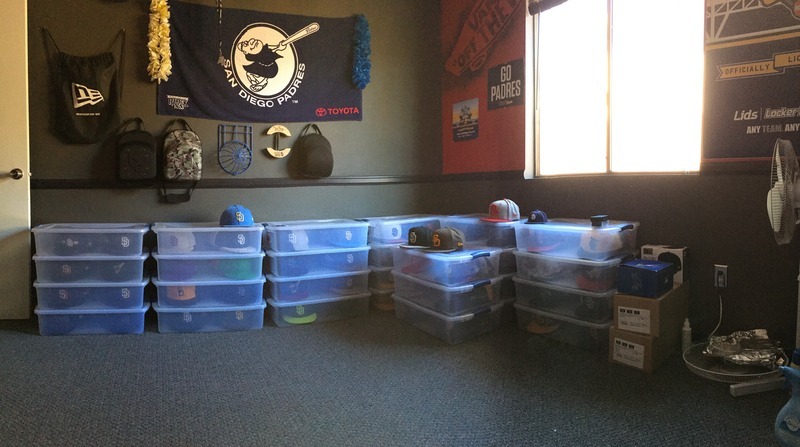 Have about 200 total about 60 being Padres hats, but mine are all on the walls. Daunting task of keeping dust off of them. Go through a lot of compressed air cans to say the least.